Jacques Stella (1596–1657), Minerva and the Muses (c 1640-45), oil on canvas, 116 x 162 cm, Musée du Louvre, Paris. Wikimedia Commons. After their catastrophic wedding feast, Perseus and Andromeda returned to his home at Seriphos, still under the protection of Perseus’ half-sister, the goddess Minerva. Ovid then leads on to a complex interconnected web of stories, which start with Minerva’s departure from Seriphos, then hand over narration to the Muses. When Minerva leaves Perseus and Andromeda in Seriphos, she heads straight for Helicon, the mountain abode of the nine Muses. The goddess has heard that Pegasus, the flying horse ‘born’ from the blood of Medusa, has brought forth a new spring on Helicon, which arose from his hoof-print. Urania, Muse of astronomy, welcomes Minerva and confirms the story about the new spring and its novel origin. One of the Muses then raises concern for their safety, telling the story of Pyreneus who had tried to imprison the nine in his house. Fortunately for them, he then leapt from the high tower of that house, and his skull was smashed. The challenge made, the nine Pierides (daughters of Pierus) then sang their tales in turn. They told false stories of the Titans, which belittled the gods, including claims of the gods had taken refuge in the form of animals. After the Pierides had finished, the Muses sang their tales. They offer to repeat these for Minerva, who accepts, and sits herself down for the next – and much longer – story, which I will tell in the next article. 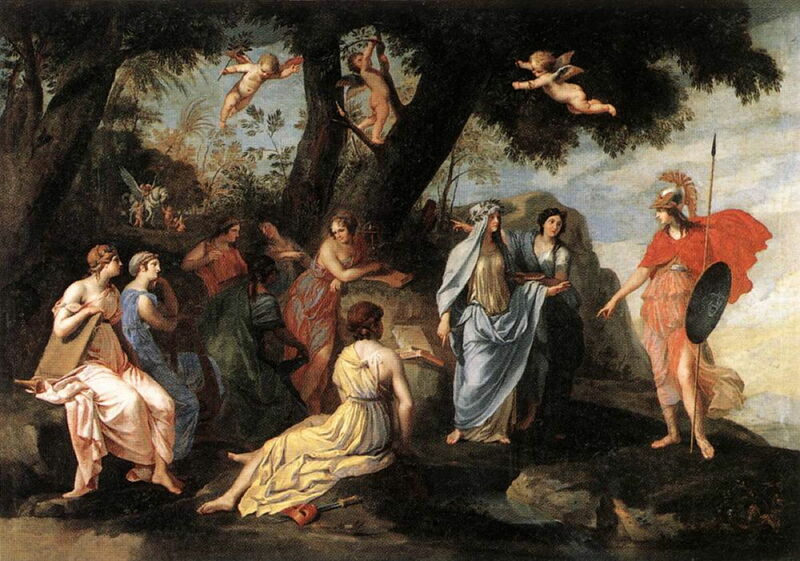 Today, the myths of Minerva visiting the Muses on Helicon, and of the Pierides, may seem obscure, but they were popular through the seventeenth century, and have been quite frequently painted. Indeed, several artists of that period seem to have become quite obsessed with the story: around 1600, Hans Rottenhammer painted at least two different versions of Minerva visiting the Muses, and Hendrick van Balen made at least three. Joos de Momper (1564–1635), Helicon or Minerva’s Visit to the Muses (c 1610), oil on panel, 140 x 199 cm, Koninklijk Museum voor Schone Kunsten Antwerpen, Antwerp, Belgium. Wikimedia Commons. Joos de Momper’s splendid Helicon or Minerva’s Visit to the Muses (c 1610) is one of the most complete accounts to be firmly rooted in Ovid’s Metamorphoses. Pegasus, perhaps a little smaller than I had imagined, rears on his wings at the top of the new spring, which cascades down a small cliff at the right. Minerva – suitably helmeted, holding her spear in her left hand, and with her shield bearing the image of Medusa’s head (an Aegis substitute) – is at the left. Between them are the nine Muses, each busily engaged in exercising their arts, with a mischievous putto fiddling with the back of the organ. Wheeling above a rugged landscape of Helicon are slightly more than nine birds, some of which bear the distinctive black and white markings of magpies – the Pierides after their transformation. Jacques Stella’s Minerva and the Muses (c 1640-45) is a slightly later, but almost as complete, account. We are clearly higher up the slopes of Helicon, and in the distance on the left is Pegasus, being mobbed by putti. Minerva is on the right, armed with her spear and Aegis-shield. Several of the nine Muses are accompanied by appropriate attributes, and two are engaged in conversation with Minerva. There’s no sign of the Pierides, though. Hendrick van Balen (1573–1632), Minerva and the Nine Muses (c 1610), oil on panel, 78 x 108 cm, Private collection. Wikimedia Commons. Hendrick van Balen’s Minerva and the Nine Muses (c 1610) also shows all the key figures. 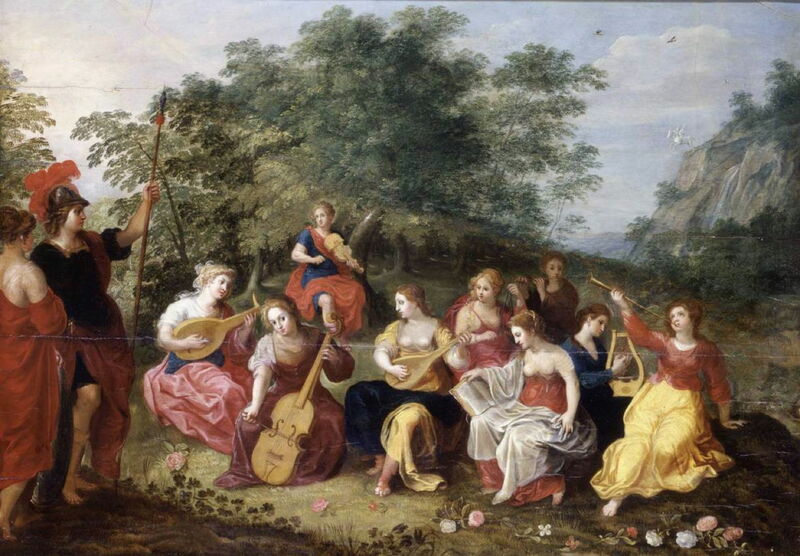 The nine Muses are seated, forming a small orchestra with their contemporary rather than classical instruments. Minerva, at the left, is being engaged by a tenth woman, whose identity is not clear. In the far distance, just beyond a waterfall (the new spring), Pegasus is about to take off from a high cliff. Above there are two magpies, implying the imminent arrival of the Pierides. So by the mid-1600s, these stories seem to have largely faded from the canvas. Occasional works appeared, from Richard van Orley in 1732, and Jean Pierre Norblin de la Gourdaine in 1830. 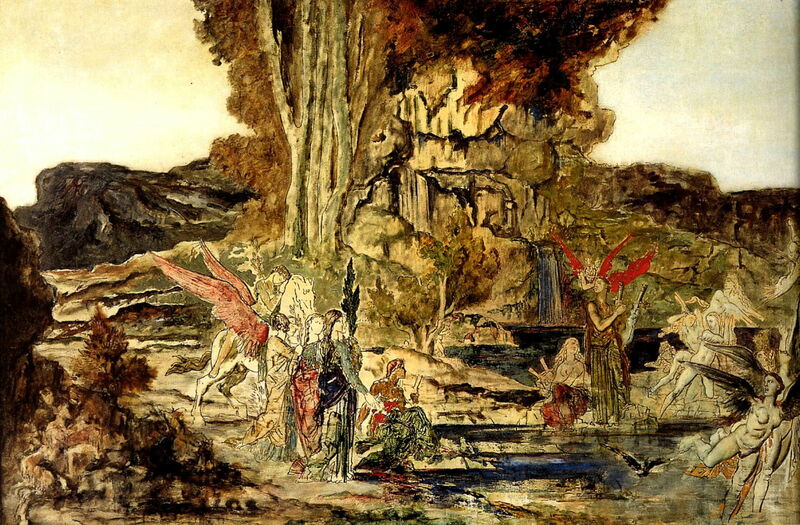 Then in 1886, Gustave Moreau started to paint The Pierides, which he sadly never completed. What we see of his work in progress is something of a puzzle, as a result of the confusion of names (which is hardly of Moreau’s doing). For in later classical times, the Muses also became known as the Pierides, so Moreau’s title could refer to either the Muses themselves, or their failed rivals. This confusion arose because the Muses, the daughters of Mnemosyne and Jupiter, were born in Pieria, near Mount Olympus, and were sometimes referred to as being Pierians. In any case, there are at least fifteen figures in this painting, although some are in groups of three, and some are winged. It seems most probable that the black-winged figures are intended to be the daughters of Pierus who have been turned into magpies and are now fleeing the triumphant Muses. It is a great shame that Moreau never completed this painting, which should have made its story clearer. My favourite has to be Joos de Momper’s fine and complete telling of Ovid’s unusual story, although it would have been very exciting if Moreau’s painting had been completed. Posted in General, Language, Life, Painting and tagged de Momper, Metamorphoses, Minerva, Moreau, Muses, myth, narrative, Ovid, painting, Pegasus, Stella, van Balen. Bookmark the permalink.